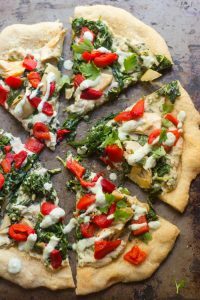 Creamy roasted garlic cashew sauce is slathered over a crust and topped with garlicky spinach, marinated artichoke hearts, and smoky roasted red peppers to make this scrumptious vegan white pizza. As I was photographing this it occurred to me that it’s not much of a fall recipe. This pizza is so green! 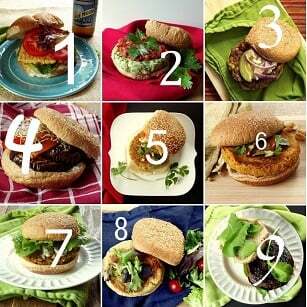 And bursting with herbs and veggies! Where’s the squash? The apples? Cinnamon? But then it occurred to me that Halloween and Thanksgiving aren’t the only big fall things that people plan their food around. It’s football season, right? I think so, and even though I don’t watch football, I do happen to love football season, mainly for the food, although the clear aisles at the supermarket and home depot don’t hurt either. One year I even took a road trip to New York during a big game and it was smooth sailing. So hooray for football! This recipe combines two of everyone’s football munching favorites: pizza and artichoke spinach dip. I’m sure at some point in my lifetime I sat through a football game for at least one of those foods. These days though, I avoid both for the dairy. Good thing I’m an expert at working around dairy these days! 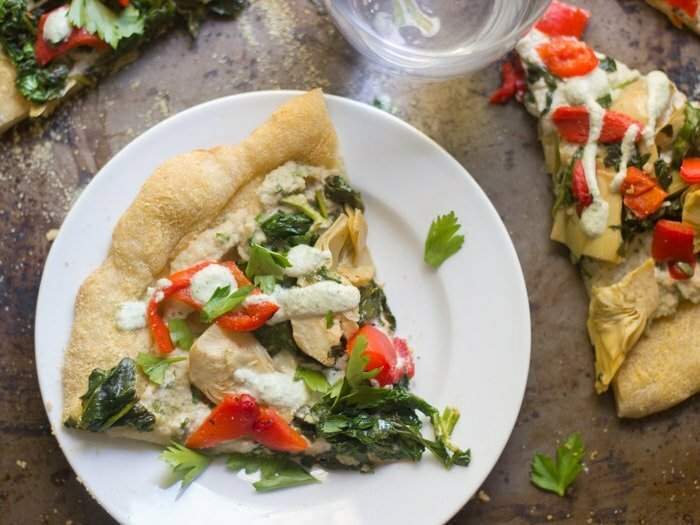 Spinach artichoke works great as a white pizza, so I went and made this a vegan white pizza, using creamy cashew sauce as my white pizza base. This pie was super creamy, super garlicky, and packed with veggies. And yes, it tasted like spinach artichoke dip? The cool thing is that you don’t even need a bread bowl, since everything gets piled on a crust. As with most pizzas, you can throw some additional toppings on this if you like. I seriously debated including some sautéed mushrooms or black olives, both of which would be excellent I’m sure. I ended up going with roasted red peppers because I had some on hand, and they add a nice burst of color. Use a sharp knife to cut the top off of the garlic bulb, exposing the cloves. Place the garlic on a sheet of foil and drizzle with about 1 tablespoon of olive oil. Loosely wrap the garlic in the foil and roast it until the cloves are soft and browned, about 40 minutes. Remove it from the oven and open the foil so the garlic can cool a bit. While the garlic roasts, coat the bottom of a large skillet with 1 tablespoon of olive oil and place it over medium heat. When the oil is hot, add the 2 cloves of minced garlic and sauté until very fragrant, about 1 minute. Add the spinach and continue to sauté until it wilts, about 4 minutes. Stir in the artichoke hearts, then season with red pepper flakes and salt to taste. Remove from heat. Place the cashews, milk, vinegar and 1/2 teaspoon of salt into a food processor bowl. Squeeze the garlic to extract the roasted cloves and add them to the food processor bowl. Blend until smooth, thinning with extra milk if needed. You want the mixture to be the consistency of whipped cream cheese. 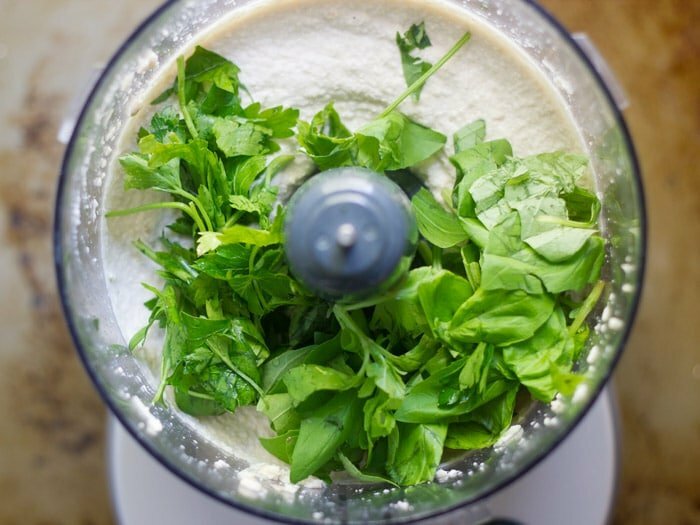 Add the basil and parsley and pulse a few times to blend. Taste-test and add more salt if you like. Lightly oil a baking sheet. Roll the pizza dough to a 14-inch circle and transfer it to the baking sheet. Brush the top with 2 tablespoons of olive oil and optionally sprinkle it with cornmeal. Bake the crust for 10 minutes, then remove it from the oven and slather with the cashew mixture, optionally reserving a couple tablespoons for topping. Distribute the spinach artichoke mixture over the cashew mixture, then top with roasted red peppers. Place the crust back in the oven and continue baking until lightly browned, about 10 minutes more. 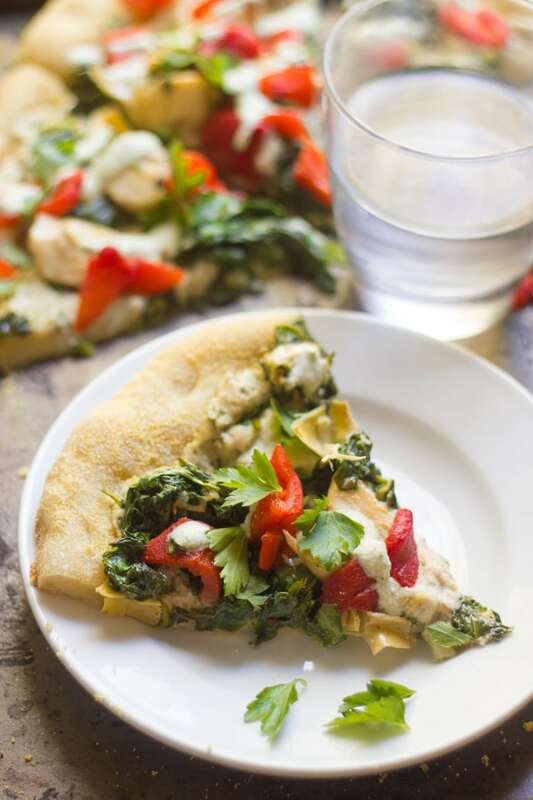 If you reserved some of the cashew sauce, thin it with a bit of water or non-dairy milk, then drizzle over the pizza. Slice and serve. I made this pizza last night. It was the best pizza ever! The sauce was amazing.